Partly cloudy. Low 52F. 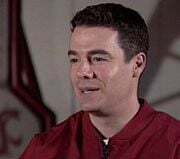 Winds S at 5 to 10 mph..
PULLMAN, Wash. - During a press conference Wednesday, Tony Bennett, who led Washington State to its finest basketball season in six decades, announced that he will stay at WSU. For more in-depth coverage tune into KHQ Local News at 5 and 6 p.m.
Bennett and athletics director Jim Sterk have agreed to a 7-year contract with enhancements, but are still working out the structure and the details. He also said that new agreements will likely include salary bumps and further compensation for assistants and other staff. The 37-year-old coach was making about $350,000 a year. During the press conference, Bennett gave high praises to the WSU program, saying "I love the character of the young men on our team and the character of the administration." He said for the most part he'd already made the decision. "I want to be a part of Cougar basketball." The WSU Head Coach also confirmed that he was given offers by other programs saying "There were other opportunities offered to me, but I chose not to pursue them." Bennett had a remarkable year as head coach of the Cougars. He led his team to 26 wins this season and a berth in the NCAA Tournament for the first time in 24 years. This year's team tied WSU's 1941 national runner-up team for the most victories in school history. Coach Bennett was named the Pacific-10 Conference, United States Basketball Writers Association District 9, National Association of Basketball Coaches District 14, Collegeinsider.com Pacific 10 and Basketball Times National Coach of the Year. He is also a candidate for the Naismith Award, the award to be announced on March 31.